This beautifully furnished house surrounded by greenery is situated in Linardići, a small village about 10km distanced from Malinska and town of Krk, in a quiet environment, ideal for a relaxing holiday. 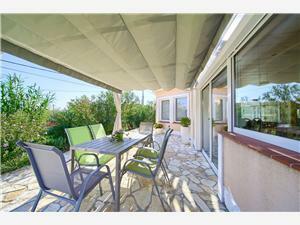 In a 500 m² courtyard is situated a spacious house on two floors with space of 200 m², with swimming-pool of 18 m2. A spacious terrace is linked to a hot tub space, comfortable living room with dining area, fully equipped kitchen and bathroom with shower. Stairs are conecting living room and upper floor where you can find three double bedrooms, another living room with sofa bed and Sat-tv, bathroom with massage bathtub and spacious balcony with sea view. Guests have on disposal few parking places, air-conditioning, WI-FI, TV-SAT, dishwasher and washing machine. Pets are allowed.